A properly functioning system requires regular maintenance. Leaking and poorly maintained septic systems release nutrients, bacteria and viruses that can be picked up by stormwater and released into nearby waterbodies. Septic systems are more prevalent in the northern Westchester County communities. These homeowners rely on septic systems to treat and dispose of household wastewater. Properly designed, installed, and maintained septic systems have little adverse effect on the environment. As a homeowner, you have a major influence on how well your septic system works. Maintenance is the single most important consideration in making sure a septic system will work well over a long period of time. Too often homeowners forget that whatever goes down the drain or toilet ultimately either finds its way into the soil or remains in the septic tank until it is pumped out. Use common sense and you should have few problems with your septic system. Use a Homeowner Septic System Checklist. Know the location of all components of your septic system; keep heavy vehicles away from the system. Don’t plant trees or shrubs near drain tiles since their roots can clog drain lines. Dispose of household chemicals properly. Do not pour them down the toilet or drain. They can destroy the bacteria of the septic tank. Distribute your laundry chores throughout the week to avoid overloading the system on any given day. Don’t use garbage disposals. They contribute unnecessary solids and grease to your septic system. Conserve water whenever and wherever possible. Don’t use toilets as trash cans. Plant only grass over your tank and fields. Monitor your septic tank yearly and have a reputable contractor remove sludge and scum every 3 to 5 years. This helps ensure that there is enough space in the tank for waste-water, and prevents solids from escaping into the absorption system. Westchester County offers a septic system maintenance reimbursement to help pay for the cost of septic tank pump-outs and inspections for residential and commercial properties in county sewer tax districts. 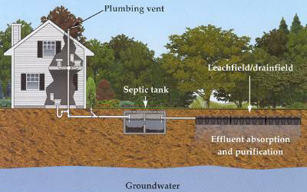 Septic systems have two key components – a septic tank and a soil absorption system. The septic tank is a container that receives wastewater from your bathroom, kitchen, and laundry room, allowing the heavy solid particles to settle and light materials to float to the surface of the tank. These materials become sludge and scum. Bacteria in the wastewater feed on the sludge and liquefy the waste products. This process requires time. To permit enough time for settling and floatation, regulations require that septic tanks be sized according to the expected daily flow and waste water from your home. The soil absorption system (drainfield) consists of a distribution box, perforated distribution lines made of tile, and an area of soil. The soil absorption system receives wastewater from the septic tank and removes harmful, disease-causing micro-organisms, organics and nutrients. For this part of the system to function properly, it must be constructed carefully on suitable soil. The soil needs time to filter out these harmful materials from the wastewater. Sand is not a suitable soil because it allows wastewater to pass through too fast and clay accepts only small amounts of wastewater. State and local regulations that determine what constitutes suitable soil have been developed after careful consideration of many factors that affect a soil’s ability to adequately treat domestic waste-water. The threat of disease is a key problem with treating human wastewater. The epidemics that killed millions of people in the Middle Ages were caused by mixing of human waste with drinking water supplies. Domestic wastewater contains bacteria and viruses that cause dysentery, hepatitis, and typhoid fever. To protect your health, it’s important to exclude these organisms from both surface and groundwater. That is why sewage treatment plants use chlorine and other biocides (substances destructive to many organisms). Fortunately, soil and soil bacteria can effectively remove pathogenic (disease-causing) microorganisms from wastewater treated in a properly functioning septic system. Nutrients such as nitrogen and phosphorus, contained in domestic wastewater, can cause both health and nuisance problems if allowed to reach surface or groundwater supplies. Nitrogen in its nitrate form poses the most significant threat to our health. When ingested by infants, nitrate can interfere with the blood’s ability to carry oxygen, causing “blue baby” syndrome. Nitrogen carried in septic tank wastewater is usually in the form of ammonia. This ammonia is readily transformed into nitrate, which can easily become part of ground and surface water supplies. Nutrients also fuel the growth of algae and are responsible for the subsequent loss of oxygen, causing serious problems for our local waterbodies. The Westchester County Department of Health provides more information on septic system maintenance and has lists of licensed septic contractors, professional engineers and registered architects.